Have you ever wondered what it’s like to travel with a celebrity? One thing we didn’t anticipate about travelling with Ella is her celebrity status. 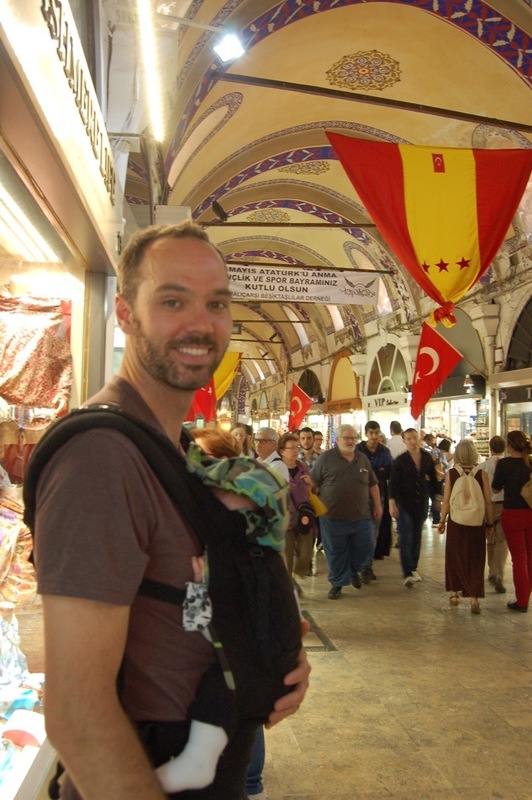 Who knew that at 4 months old she would be so popular with the Turks. 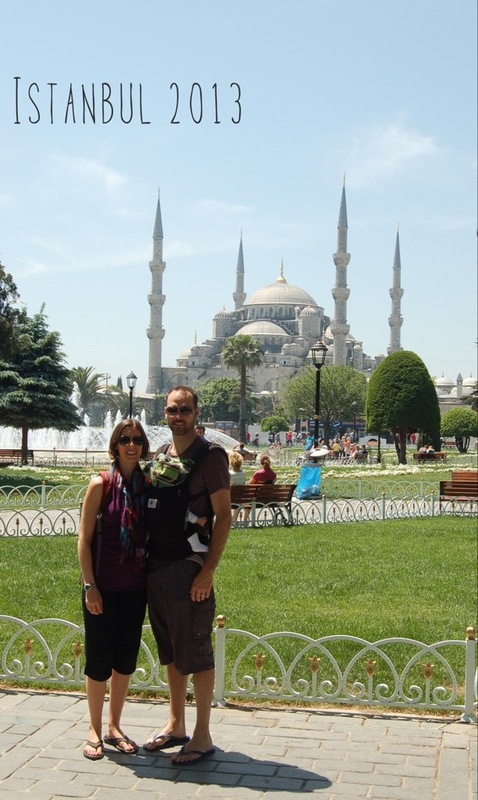 It started as soon as we boarded our Turkish Airlines flight to Isatanbul. Though Ella was one of 6 infants on our flight, the flight attendants were all very keen to come by and meet Ella. Even one of the pilots made a cooing sound as we got off the plane in Istanbul. That was just the start. We had people stopping us while we waited for a ride to the hotel. 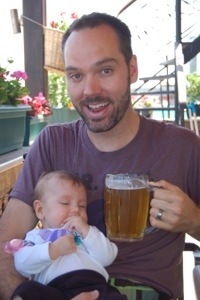 Maybe we just live in a neighbourhood where babies are a dime a dozen, but this doesn’t happen at home. The long overnight flight left me pretty shattered since I don’t sleep much on planes. Normally this would make for a pretty good night’s sleep the first night in the new place, but apparently Ella didn’t get that memo. 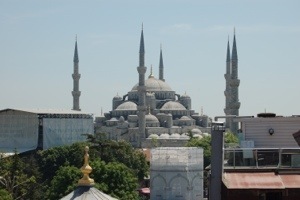 I’m not complaining as she was a champ on the plane, but let’s just say it was not a very restful first night in Istanbul. Of course, it’s possible she was just registering a complaint about the quickly deteriorating class of travel. First there was the ride from the airport. It was supposed to be quick, so when we couldn’t get a car seat (the only leg of the journey where this was the case) we thought we could make do. Unfortunately we hadn’t accounted for some brutal traffic and it ended up being an hour in the stifling heat, first with Ella in her carrier and eventually Ella needing an on-the-go meal from Katy. Maybe I can forgive her being a little annoyed. Despite the lack of sleep, we set out for our first day in Istanbul. Normally Katy would have had a packed schedule for us to follow, but since we have the rookie with us we decided to let her set the pace and ease into things. The location of our hotel is great. 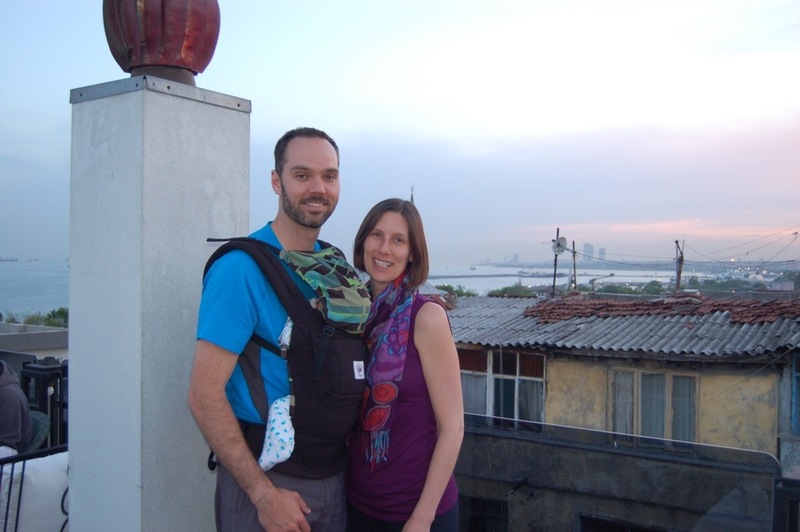 It’s a short walk to Hagia Sofia and the Blue Mosque so we decided to put Ella in her carrier and see how far we got. 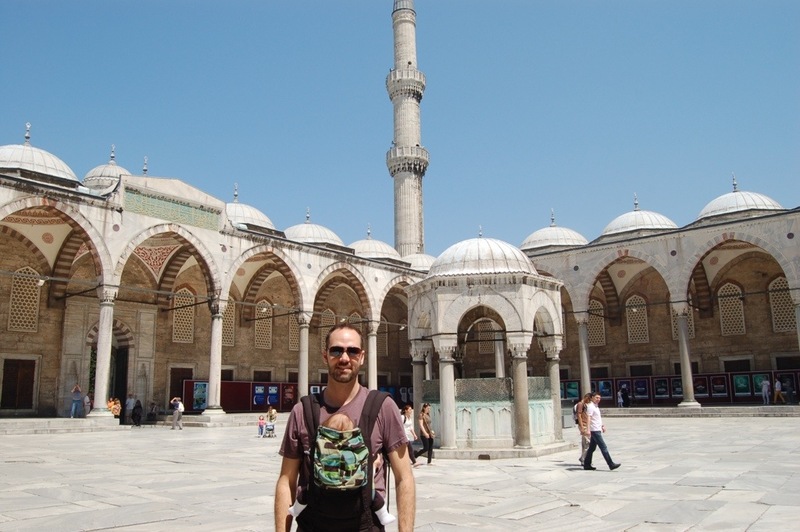 The Blue Mosque wasn’t open and we weren’t dressed appropriately, but we did have a look around the courtyard. 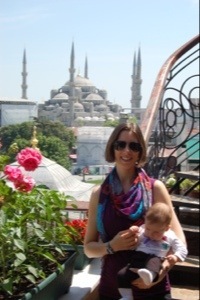 Between the Blue Mosque and the Hagia Sofia is a very nice park/promenade area where Ella was greeted by many of her new fans and we stopped for our first international family picture. 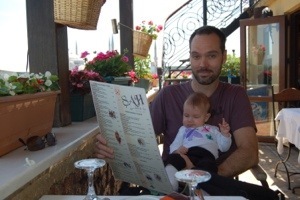 When we were getting ready for this trip, we had three big concerns: screaming during the flight, Ella not adjusting well to the time change and keeping us all awake through the night, and how we would manage to eat in restaurants. To this point we had a 50% success rate and with lunch approaching it was time to face the third. There’s no shortage of restaurants so we weren’t sure how to pick a winner. We agreed that the best approach was to look for somewhere that we could sit apart from other people and make a quick escape if Ella lost her mind. After a quick search we stopped at Sah Cafe & Bar. We planned to sit at ground level but, like many of the restaurants in the area, they had a roof top patio. Even better, we found that they had a terrace on the way that was deserted…perfect! The food at Sah was great and they had decent vegetarian options for Katy. The staff were all very accommodating about Ella and happy to have us change, feed, and essentially do whatever was needed, assuming we were willing to let them say hi to Ella. That’s the other thing about Ella’s popularity here, it’s true for both sexes. I’m amazed at how many men here rush over to say hi and rub her little feet or touch her cheeks. For her part, Ella was a star making friends with the waiters and just enjoying the view. I think one of the keys to Ella’s popularity is that when she’s in the carrier, people don’t realize she’s there at first. For example, after lunch we wandered over to the Grand Bazzar and as you can see in the picture below, she doesn’t really stand out. Walking along you get a lot of people who do a double take and then start grinning before poking their friends and pointing at Ella. After a quick tour of the Bazzar it was time to head back to the hotel for a rest and nap before dinner and more Ella surprises. Dinner was the same as lunch. Great food, this time at Tarihi Cesme Restaurant, with very accommodating waiters. Ella chose to stay asleep in her carrier rather than come out and play, but as it was a busy restaurant, we all thought that was best. While our days aren’t quite as packed with Ella’s need for naps, we were still pretty pleased with our first full day in Istanbul. Our plan of attack for the next few days, a continued leisurely pace with some bus and boat rides to see a little more of this huge cosmopolitan city. 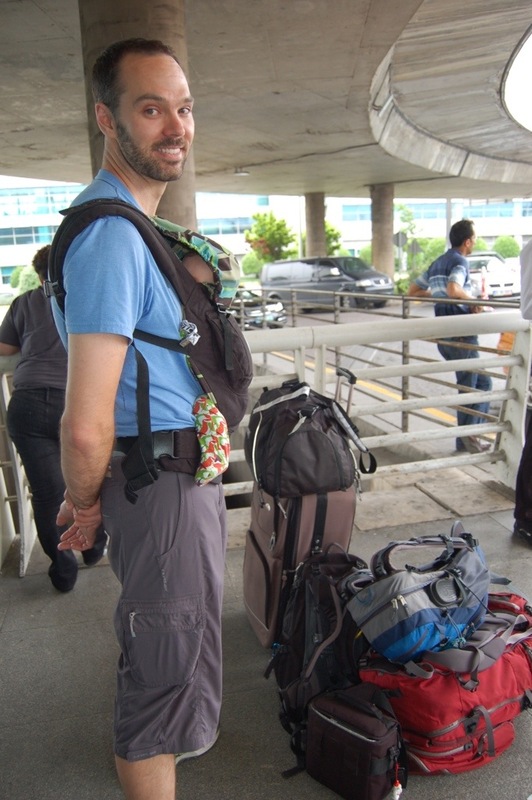 Fact #1…babies are little magnets….you will meet more people when carrying a baby…which makes the adventure even more interesting!! 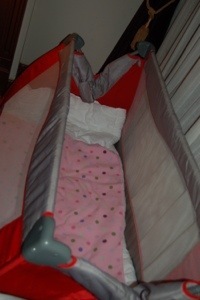 They probably walk away thinking how brave those parents are!!! Yikes!! 🙂 Adventure on!! I’ll talk to the boss.